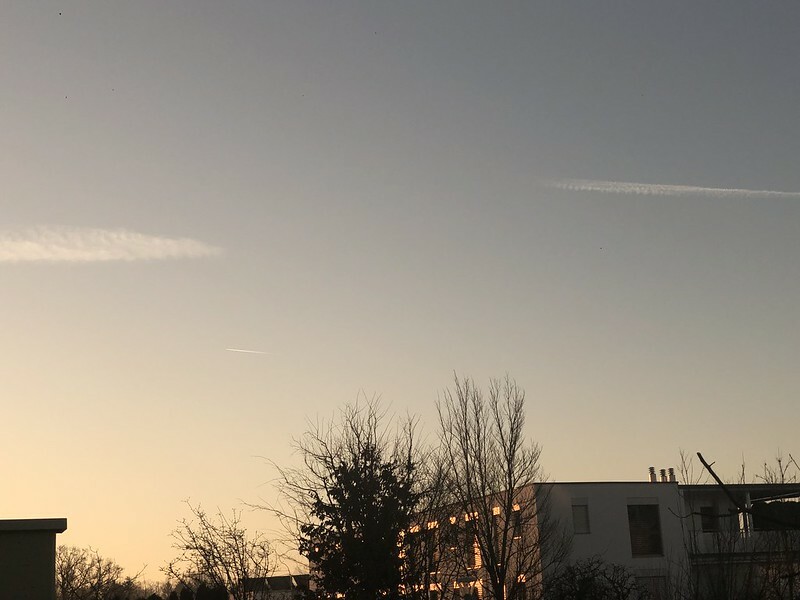 The mornings are getting better and now I even see traces of the planes that have flown by. Yesterday there was a splendid view of the alps with all the peaks in their full glory, but I just did not have the opportunity to take any photos. I was driving down from the village where the supermarket is and they were spread out before me. Our supermarket is in the village of Langendorf which is an uphill journey as it goes towards our house mountain, “Weissenstein” in the Jura. I used to take such photos from the car when Mr. Swiss was driving, but now I do not even take my camera with me, just my cellphone for a few photos. I cannot do a photo shooting when I am driving unfortunately. It’s perfect weather for a camera shoot at the moment, but I will be at home this afternnoon. Yesterday I actually managed to fix up my new camera. Luckily I know the workings of the Nikon cameras (this is my third) and they are all similar. I sort of squeezed a few minutes in and took a couple of photos. 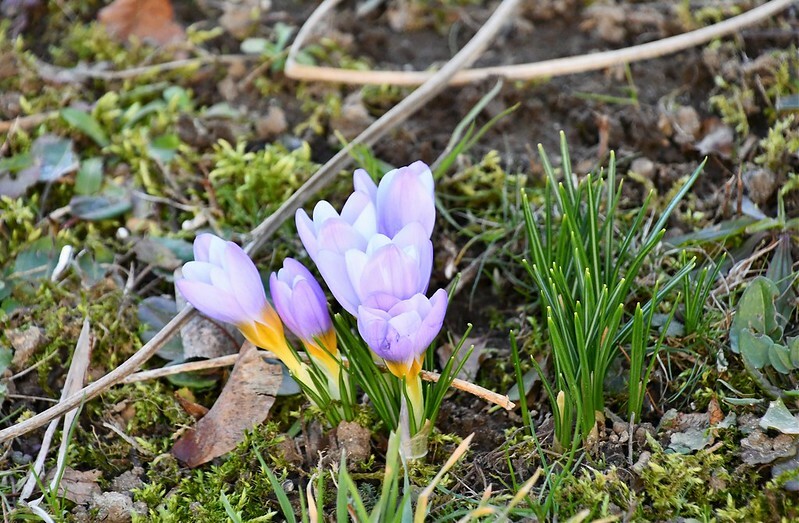 There are now crocus flowering in our wild meadow and I noticed even a couple of the early ones at the edge of my garden. It is so much easier with the zoom lens now as I do not have to change the lens (which I am usually too lazy to do at home) as it is permanently on the camera and has a range from 18-300 which covers almost everything. I now have my eye on a wide angle lens, but they are a little in the higher league of prices, over a thousand francs, but I am thinking about it. I am now at an age where I really ask what am I saving for. I worked all my life and for the remaining years (OK I am not really ready to go yet) I should have some benefits. I cannot take the cameras with me when I go, as I am not sure if I will be able to upload the photos on WordPress afterwards (OK, I love a little black humour now and again). And if I stand at the local castle on the hill and take a photo of the alps. depending if you have a good visibility day, I would get the whole range and not just the big three (Eiger, Mönch and Jungfrau). I am thinking about it. I now also have a car to finance as well. Being a golden oldie you still need money, but there are no more perks to hope for. The government does not increase its pensions every year to suit the cost of living index like it used to be when working, and you just have to stretch it a bit more. And now to move on. There are things to do, life is never boring when you are a golden oldie, and you must still eat, so I will be cooking. I also have No. 1 son’s bed linen to iron and a few other bits and pieces. Have a good day everyone, and may it be a good one. You live in such a beautiful place. Hearing you talk about cameras and wide angled kenses etc. sounds like my husband. He used to do all of that. Have a lovely day. Oh I so agree re the wheelchair. You can indeed carry things when in it. We used to go birdwatching a lot, and there were many of the “hefty’ crowd around here. Meaning the nen who came with their massive equipment including the cameras. That was, I think, what got hubby into wanting better equipment. Not to be in with the crowd, because we were never one of them, but to ohotograph birds. We got some lively photos of Short Eared Owls which are quite rare. And ospreys,which you can only catch twice a year here as they pass by on their way either to their nesting places, or to Spain or Africa at the end of the breeding season. Which reminds me – the ospreys will be back soon. Hurrah! We watch them on webcam, and oh, what things they get up to. EJ is a real character. She nests at Loch Garten in Scotland, and she has dalliances with other men, then her real partner realuses the eggs are not hus, so throws them out of the nest. Then last year her partner had seemingly died and she had got a new man but he was no good. Wouldn’t feed either her or the babies and all the babies died. Mi hope she gets a decent feller this year and doesn’t play around herself and produces some good chicks. She is quite old now though! 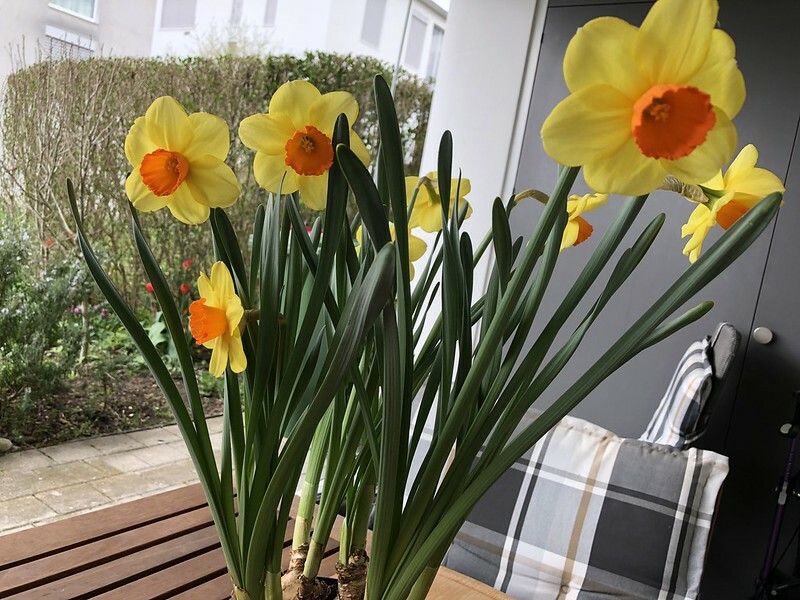 The daffodils are a cheerful view. We got another dusting of snow last night. It snow/rain at night and warns in the day and melt the snow. Interesting winter. And we have spring weather. This afternoon we sat ourside in the sun. Our weather is still unstable. The sun is shining now. We have had some gorgeous sunrises and sunsets. I have been taking photos of the spring flowers, more to make stop and notice them! I’m not sure about WordPress in the afterlife, apparently they are old school, No Wifi! I’m tired of being a wife. I want to be a husband and have a wife to take care of ME. Good Morning! I should catch up today, although I have a lot of other work too. How nice that crocus naturalize there. They are the sort of thing that we often plant here, and justify as it is something that naturalizes, but then continue to plant a few more annually because they do not actually naturalize. If not replaced, they are gone within a few years. It just does not get cool enough for them in winter. Some daffodils and naricssus naturalize if they happen to be in a spot they like.